One in five teenagers between the ages of 13-18 struggle, or will struggle, with mental illness according to the National Alliance on Mental Illness. Specifically, 11 percent of American youth have a mood-related disorder, 10 percent have a behavior or conduct disorder and eight percent have an anxiety disorder. Sadly, statistics also show that 80 percent of those kids will not receive help to cope with their disorder. Mental illness is defined by the Mayo Clinic as a condition that affects mood, thinking, and behavior. There is an extensive list of mental illnesses, but some of the most prevalent are anxiety disorders, depression, eating disorders, schizophrenia, and addictive behaviors. A mental health concern can become a mental illness when symptoms are ongoing for a prolonged period of time, affect a person’s ability to function, and cause frequent stress. The subject of whether or not ADHD is a mental illness is a complex topic. Although ADHD meets the definition of a mental illness since it affects mood, behavior, and thinking, medical professionals are more likely to refer to it as a behavioral disorder or learning difference. For this reason, ADHD is not included as a mental illness in this article, nor are other learning disabilities, such as dyslexia. The Modern Saint conducted a survey in the Upper School, and 153 students responded. 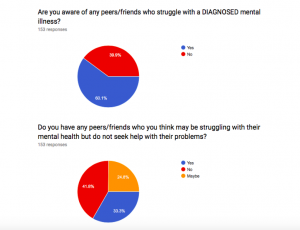 Out of those 25 students, 32 percent reported feeling support, 44 percent reported only sometimes feeling support and 11 percent reported not feeling any support after sharing with others about their diagnosed mental illness. As a School, we need to prioritize spreading awareness about mental health issues. It should be our goal to make these students feel supported and to encourage one another to be candid about mental health. There are numerous people on campus ready to provide support. Mrs. Dickinson encourages students to talk to her, a teacher they feel comfortable talking with, or even the school nurse. Additionally, religious students can also discuss issues with Father Mel, Mr. Parks, and Mrs. Hoad. Outside of school, students can talk with a therapist, psychologist, or psychiatrist. There is even a Resource Board on The Wire with mental health resources (click on the “Resources” tab at the top, then click on the “Counseling Resources” board). The cause of the sudden increase in mental illness among teens is a complicated one. A prevalent issue Mrs. Dickinson notices is the societal shift from a more tight-knit community, (think walking to school, having dinner with your family, being friends with all your neighbors), to a community with less support and less communal involvement. Moreover, in the present day, teenagers are under an extreme amount of stress at school; this is partly due to the U.S. population increasing but the number of colleges and universities has stayed fairly constant, making college admissions very competitive. Finally, teenagers’ obsession with technology and social media often results in late night screen time, causing them to be sleep deprived, which can exacerbate mental health problems. While the recommendation for teenagers is to get 9-10 hours of sleep per night, the average Upper School student at All Saints’ only gets 6.5 hours, according to the recent Challenge Success student surveys. It is vital that we continue to speak up in this manner and continue to educate each other about mental illness to debunk the stigma and better support our peers.